The continuing adventures of the Lace-Rock Gang requires me to craft a new set. You may recall that in the last episode Kitty Luong was abducted by some rather green looking pirates. This isn't to say that they were seasick, or inexperienced, or anything else of the sort. They were, in point of fact hale, hearty, and as far from water as possible. Also quite accustomed to the work they were doing. 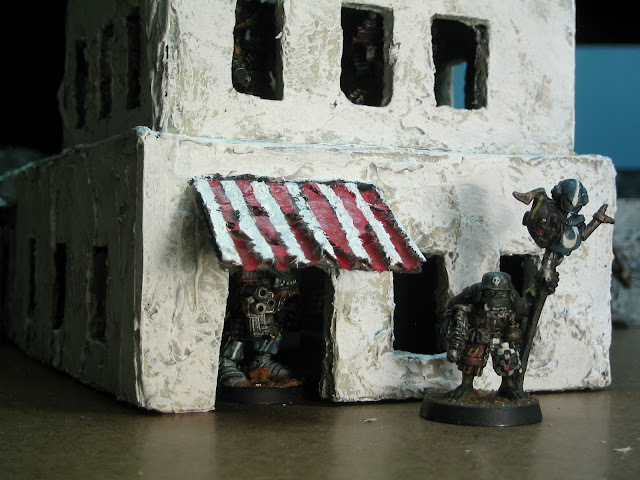 However, all this notwithstanding they were quite green, being orks. 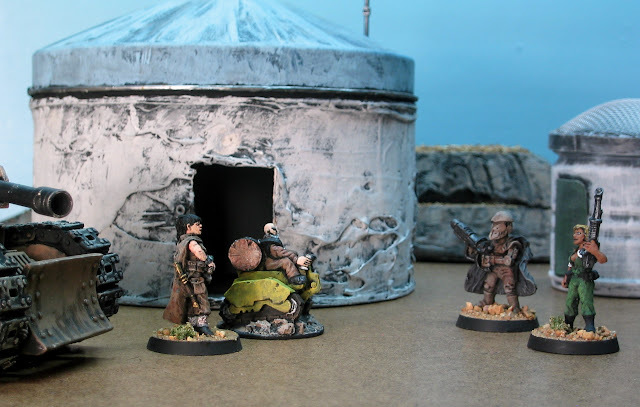 Well, if the gang is to rescue their girl in "Hello Kitty on a Hot Tin Roof" then I need an orky place where orky pirates might take her. This is something of a quickbuild, though not a one day project, as I figure I need to slap together a small village or at least a decent cluster of huts. Fortunately, orks aren't known for the quality carpentry. As I see it they probably live in conditions generally similar to many semi-nomadic desert dwellers. 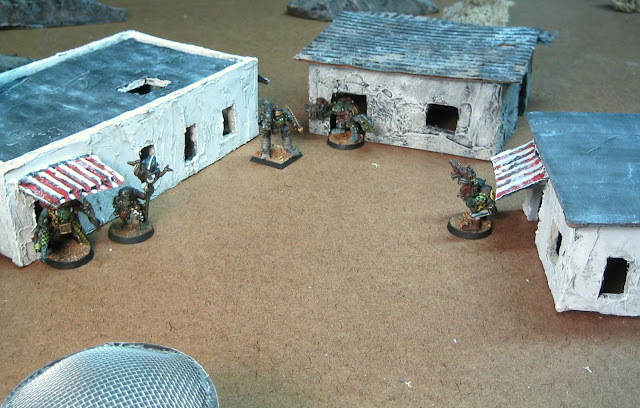 Which means I figure I can use the ork huts for other purposes in the future with the addition of some reasonable set dressing. I'm not repeating this yet, but I want the new buildings to fit with it. This time I went with a more conventional foam-board experiment. In the first shot below you can see two structures, one substantially complete, though not as yet fully painted, and the other still in early days. I'm loosely drawing on adobe or stucco structures one might find in the Middle East or the American West for inspiration. I moved away from the round building for now, as squares are easier to build, more temporally flexible, and facilitate greater building density should the need arise.The basic structure is, as you can see, pretty standard. The one element of the building that might be a little novel is my use of wallboard joint compound. I bought this a fair number of years ago. It's served me fairly well. You might argue that it's too brittle and delicate, but I figure if you can finish a wall with the stuff you can finish a model with it. Once it's cleaned up and sealed with paint it becomes a fairly durable surface. Below you can see it applied to the exterior walls. Thinner coats will dry faster, but you can build it up to cover miniature sins. (Hey, that's what it's for in real walls too!) If you want a smooth coat you can sand it down to a very fine finish, but I wanted roughness and irregularity. I use it first foe texture and only second to fill gaps. You don't even need to completely cover a wall to create an effective texture. On the long windowless wall at right you can see where the dark foam-board shows through, but once it's painted it looks much the same as the other walls. Here's a few pictures of the finished structures with some of the fine fellows who might inhabit them. 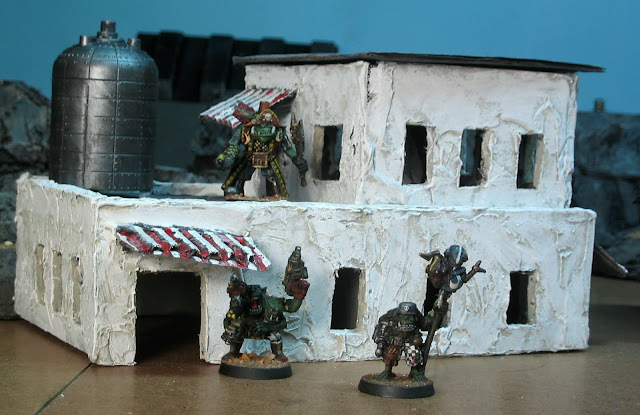 Ever wondered how a vacation picture at an ork settlement might look? Wonder no more. Here's one of Kitty's shots from her very pleasant stay in the Moab Wastes outside Logansport. The next build will be a little different, though you can see that some of the same techniques apply. More on this one later when it's complete. This will ultimately be the town jail. I suspect the ork settlement is really a reclaimed mining camp, given the remarkably similarity of the buildings to human architecture from old Terra. The second part of the build is up and running in Intergalactic Hoosegow. Take a peek to see how the jail came out. It's a twist ending, boys and girls. Keeps you on the edge of your seats. And do check back. There's more coming soon, as this build progresses, and there are a few other bits of old business and back-burner projects that could use updating. As always, thank you. See you soon, space fans. Keeping things generic enough to translate through a few different uses is always a good idea. I try to view it like set dressing for TV shows: fairly bland main pieces (adobe dwellings) with characterful bits (a space crows nest with an ork in it) added to give it flavour. Thank you Cheetor. That was my plan, more or less. I've worked in theatre for the best part of the last twenty years now, so it comes fairly naturally to me to think of this as a sort of theatre in miniature. I've been toying with what pieces would "orc it up" properly without requiring permanent alteration. A gent over on the oldhammer forum recommended checks and glyphs. I'm hesitant to add glyphs for precisely the reasons you mention, but some checks around the door on the big house might be a nice touch. Generic enough to work in several cultures. The orc crow's nest is a brilliant idea. An orc vehicle or two and maybe an orc workbench under an open shed will be solid thematic set dressing. I figure I could also use some small set pieces like an outdoor kitchen and a well.